The Excel Resource Demand and Planning template (GanttDiva) is an easy to use and configurable Gantt chart system for project planning with labor and resource demand burn down analysis. The VBA driven Excel template allows for scheduling under dependency logic with flexible date and style customization options. Resource demand analysis can be undertaken at project or targeted filtered task set levels. Labor demand can be visualized in hours, as full time equivalents or configured periodicity. 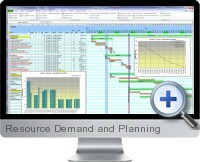 Multiple resource demand charts can be generated for comparing project planning scenarios and impacts of changes in time scheduling. Task filtering to quickly and easily find and analyze detail for specific processes and resource demand. Support for task dependencies based on all combinations of start and finish dates. Labor demand charting to visualize resource requirements for the project or phase. Project progress reporting showing physical progress under both cost CPI and time SPI metric bases. Choose from different styles for timeline reporting that depicts specified filters for chronological tasks and associated chart. Extensive help material explaining step by step usage, scheduling concepts and logic. A configurable calendar to define workdays, weekends and holidays for the project. Import, export with bulk copy and pasting functionalities allow to quickly redefine and reuse block of tasks within and between projects. Professional reporting with customizable colors and styles as well as full vector graphics for visualization and presentation purposes. Compatible with Excel 2007 and above.